It’s January, and it’s a new year. A new year brings motivation for some updates in our life. One of those updates may include refining a routine like your baby’s skin care routine. A routine may sound labor-intensive, but it can actually simplify your day to day life. Dr. Amy and the Baby Pibu team aim to provide both a safe and simple baby skin care routine so you can enjoy your time with baby even more. Here is your 101 on a safe and simple baby skin care routine: it is a blended bath-moisturizing-diaper care routine. Consider your baby’s bath routine as part of your baby’s nightly bathtime-bedtime routine. The advantage of this is that your baby will associate bathtime with bedtime, and that can ultimately help ease your baby into bedtime and sleep. Keep your baby’s bathtime routine safe and simple with these tips. Baby Pibu’s Bathtime Wash is also available in a 16oz bottle with pump to make bath time easy and simple. Tip #1: Make sure the water temperature is not too hot. You can use a fancy gadget, but we suggest you simply test the water temperature yourself. You want warm and not burning hot. Tip #2: Never, never leave your baby unattended during bathtime. Tip #3: Keep bathtime short. Less than 5 minutes for babies younger than 6 months old and less than 10 minutes for babies older than 6 months old. Water actually dries your skin out so shorter bath times are less irritating to your baby’s skin. Tip #4: Use a calming bathtime wash that is fragrance-free, tear-free, and naturally-derived. Also look for products carrying the Seal of Acceptance by the National Eczema Association (NEA). A 2-in-1 wash like Baby Pibu’s Bathtime wash keeps bathtime simple. Tip #1: Choose fragrance-free products carrying the National Eczema Association Seal of Acceptance. Moisturizing baby’s skin after bath time is an important step in keeping baby’s skin healthy. Tip #2: Choose naturally-derived products free of parabens, sodium lauryl sulfate, and parabens. Tip #3: Use a cream or ointment rather than a lotion. Ointments are better than creams, and creams are better than lotions at moisturizing the skin. Ointments and creams are typically composed of 80% oil and 20% water while lotions are 80% water and 20% oil. Remember that water actually dehydrates the skin so less water in products is better. 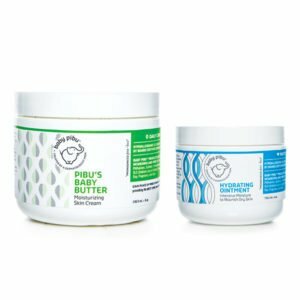 Choose Baby Pibu’s Baby Butter or Baby Pibu’s Hydrating Ointment. Complete your nightly routine and protect baby’s bottom with Baby Pibu’s Bottom Balm. Tip #1: Apply an ointment with every diaper change. Baby Pibu’s Hydrating Ointment can be used. The extra layer of ointment provides a physical layer of protection between your baby’s skin and the pee/poop. Tip #2: For long naps or overnight diaper changes, apply a diaper rash cream with zinc oxide, such as Baby Pibu’s Bottom Balm. The zinc oxide adds further physical protection for your baby’s skin. We hope this blended, safe, and simple bath-moisturizing-diaper care routine can work for you and your baby. Give it a try, and watch it simplify your life with an easy routine and make your life safer with using the right products at the right time.